You may have noticed a common theme that has been running through our newsletters over the past several months: things are changing, and they’re changing quickly. In November, we mentioned how we can use location-based services for more than filling our bellies. We looked at publishing from a historical perspective in March. Healthcare and medicine is being transformed through mobile health, or mHealth. And last month, our research has suggested that mAgriculture is just reaching American shores. 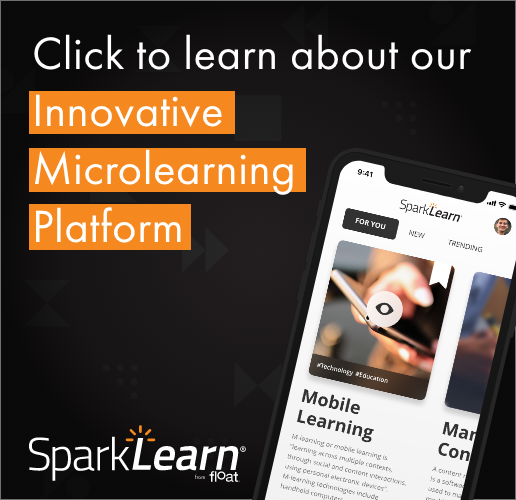 We’ve been covering a wide variety of topics and that really is because it’s becoming increasingly clear that mobile learning is a transformative force. The mobile learning momentum has continued with April’s kickoff of the next generation of SCORM, Project Tin Can. Tin Can allows for learning to take place virtually anywhere. Using the new Tin Can API, anything could be “SCORM-compliant” learning, meaning that any device would be able to talk to a Tin Can-compatible LMS. Devices and simulators, apps and websites will all benefit from Tin Can. For example, this next-generation software will allow for ubiquitous computing moments. Say, for example, a student walks into a classroom or even a hands-on workshop out in the field. Using location data, Tin Can could understand that this person did just that, marking them as attended. Upon completion of the lesson at hand, that lesson can then be marked as completed. This will have a tremendous effect on learning in organizations. Up until now, measured organizational learning has really always been formal through the use of curriculums, instructor-led training and eLearning. With Tin Can, learning can transition to become small and light, focusing on bite-size information and social and informal learning. For more information about Project Tin Can, visit the ADL blog or watch Jeff Tillett’s conversations with Tim Martin of Rustici Software, one of the driving forces behind this powerful new learning technology. As announced via this newsletter last month, the second annual Float Mobile Learning Symposium will take place in Chicago on Monday, June 25, in conjunction with Techweek. We’ll be hosting the event at 1871, a brand-new startup located on the 12th floor of the Merchandise Mart, just four floors above Techweek activities. Shay Howe, designer and user interface engineer for Groupon. Shay will be discussing HTML5 semantics. Steven Hoober, author of “Designing Mobile Interfaces” and user experience architect for Cummins. Steven will be talking about mobile design patterns and processes from his book. Aaron Silvers, chief learning officer at Problem Solutions, will talk about how to design mobile experiences. Kris Rockwell, CEO of Hybrid Learning, will focus on mobile game development. Robert Gadd, president and chief mobile officer at OnPoint Digital, will discuss enterprise security for mobile learning. This year’s Symposium, sponsored by Walker Sands Communications and OnPoint Digital, costs just $79 until this Friday, May 11, and then only $99 after that. If you are interested in group discounts for registering three or more people from your organization, please contact Adam Bockler at abockler@floatlearning.com for your discount code. First with our parent company The Iona Group and now as Float, we have worked with agricultural companies for years. Naturally, we’re excited to see our relationship with industry-leading Pioneer Hi-Bred International grow with the release of their latest app, the Pioneer Planting Rate Estimator. Using the Planting Rate Estimator, growers with an iPhone, iPod Touch or iPad can obtain a fully customized, cost-effective planting density recommendation upon entering their hybrid, grain price and seed cost. This easy-to-use performance support application shows just how easy it can be to get detailed information at the point of need. Pioneer has put the Planting Rate Estimator in the Apple App Store for free. Our own collaborative Web browser for the iPad, RabbleBrowser, has recently been updated. Version 2.5 includes some great new features that give session leaders more control over the browsing experience, such as locking the session for synced scrolling and zooming, preventing disconnects, or determining whether to allow participants to privately chat. Additionally, users can vote on the leader’s session and easily share URLs back up to the leader. RabbleBrowser 2.5 further integrates sharing via Dropbox, Facebook, Google+ and Twitter. Read the RabbleBrowser 2.5 press release, then download the application from iTunes. Dr. David Metcalf, the CLO adviser for the Institute of Simulation and Training at the University of Central Florida who recently co-authored mHealth: From Smartphones to Smart Systems, will join Float’s panel of experts – Dr. Gary Woodill, Jeff Tillett and Chad Udell – to discuss the mHealth trend on Wednesday, May 16, at 12 p.m. CT.
David has a long history in mLearning, writing the influential title M-Learning: Mobile E-Learning back in 2006. Don’t miss this great opportunity to hear from a leader in mHealth talk with the Float team. As we are every year, we’re very excited about mLearnCon in San Jose this June. Chad Udell and Jeff Tillett will present a pre-conference workshop, Prototyping for Mobile Learning, on Monday, June 18. Additionally, Chad will be co-presenting Moving Beyond ePub: Transitioning Your Content into Interactive Apps with Lisa Shannon, associate publisher at Pfeiffer with Wiley Publishing on Tuesday, June 19. Finally, Scott McCormick will present Winning Over Stakeholders: How to Sell mLearning to Your Enterprise on Wednesday, June 20. We’re also setting up a booth at the event to demo some really cool things, so be sure to stop by and say hello.